Is it really possible to save our biodiversity? By declaring 2010 to be the International Year of Biodiversity, the United Nations has demonstrated its strong commitment to saving threatened biodiversity around the world. The fact that the most diverse ecosystem on Earth is the tropics should make us those who live in tropical countries more aware about threats to biodiversity. Tropical forests contribute to large portions of nature’s rich diversity, just as coral reefs are a major component of marine biodiversity. The massive destruction of these species’ rich ecosystems will lead to a global species extinction crisis. The question is then could we really save our biodiversity? I am pessimistic. An ecosystem is an integrated living system. The loss of one species does not only mean that we just lose that species, but also means it is a decline for the ecosystem. Since humans are part of nature’s system, the loss will also affect human survival. The lost biodiversity may have medical importance or act as a biological control. Habitat degradation is the major driver of extinctions of many tropical species. In many tropical countries, including Indonesia, deforestation is the major form of habitat loss. It is predicted that about 2 million hectares of Indonesian forest have vanished every year. As a consequence, thousands of plants and animals have disappeared. Some probably have not been identified yet. It has been long recognized that the main factor of deforestation human population pressures. Brown and Pearce (1994), for example, in their book The Causes of Tropical Deforestation noted that deforestation rates are strongly linked to population growth. High population density means smaller areas of remaining forest in the tropics. The problem is not only high growth rates, but also badly distributed inhabitants. Human population growth indeed affects biodiversity. However, over-exploitation of natural resources speeds up the disaster. Mining activities, timber extractions and land clearing for other purposes are main examples of direct impact of human economic activities. Unfortunately, this condition is not only due to the economic needs of local people, but it is much more related to the greed of industrialization. In fact, mining activities, for example, do not contribute significantly to local economies. They usually just cause environmental problems for the locals. As the magnitude of human influence continues to grow, most tropical forests are predicted to become secondary forests (see 2006 article by Wright and Muller-Landau in Biotropica, “The Future of Tropical Forest Species”). Secondary forests are forests regenerating after clearing; hence, the species composition is not the original ones. Primary forests in the tropics, which contain original compositions of plants and animals, are projected to be more restricted to low population density areas, relatively low value agricultural lands and protected areas. Consequently, we are going to lose more and more biodiversity. The increase in human density may not be avoided. However, more controlled population growth as well as managing its distribution is needed in order to save our ecosystems and biodiversity. Ecosystem degradation means more than just a biodiversity loss, but again this will directly affect human survival on Earth. We need to make extraordinary efforts to save nature’s rich diversity. Biodiversity plays an important role in human life. It is the source of food and medicine. Nature’s diversity also has intrinsic values that provide services for our souls. Natural relaxation sometimes could provide us with unlimited energy. This is known as natural healing. Therefore, there should be strong connections between people and nature. Biodiversity is our life. The failure to acknowledge the important of nature biodiversity, or destroying them, is a failure to appreciate life itself. However, more conservation areas do not always mean more protected species. There is still illegal hunting and trading of protected species. We need law enforcement for this. Besides, it is the time to educate people in order to appreciate biodiversity. We could start at schools. Children and teenagers should be taught that biodiversity is important part of life. I sometimes wonder why we, as Indonesians, lack appreciation for other creatures. My own experience living in one city in Australia shows me how interesting it is to live together with wild animals. Birds play in our yards and on the parks. We just need to sit outside our home to hear them sing and to watch them play. There are more than dozens of species on our yards. When the turtle-breeding season comes, we play on the beach, while watching small turtles make their way to the sea. School kids come and watch and make sure that no predators catch the little turtles. These are activities that I never experienced even in my village on the Bukit Barisan Range, Sumatra. Therefore, educating people about the importance of biodiversity is a very important step to saving our remaining biodiversity. It has to be taught since early years. We need to keep campaigning about this to the public. Another important step has to be taken is to decrease the pressure to forest ecosystems. Wright and Muller-Landau (2006) offered policy by improving economic opportunity in urban centers, as well as creating more urban centers. This has to be followed by the quality of urban life throughout the tropics. If people move to urban centers and have more economic opportunities, the pressures to forest ecosystem may decrease. They also emphasized that policies which is designed to keep people living around forests have rarely preserved the areas. Of course this policy needs better regional planning. Extra ordinary efforts are needed in order to save our environments and biodiversity. This is for our own future benefits. If we fail to do actions, we do not have any reason to be optimistic that we could save our biodiversity. 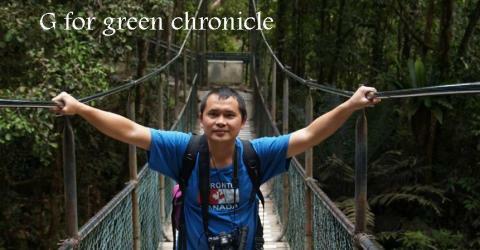 The writer is an ecologist at University of Bengkulu and an Australian Leadership Awards Fellow. Tourists to your country love the closeness to nature in the villages, but we do see it is not appreciated as it is in our cultures, for the most part. Not that our big scale biodiversity conservation is that great, though. Great to hear from an Indonesian ecologist. I also sometimes wonder why we don’t have such a strong connection and appreciation to nature. I believe that appreciation to nature and all creatures is the basic foundation for nature conservation.